The Maltese is one of the best companion lapdogs you could ask for, and they deserve some amazing kibble! We’ve researched and reviewed the best food for maltese dogs to help you provide your canine best friend with impressively tasty and nutritious meals. But before you jump down to the reviews, check out the following features to consider when looking for a new dog food. Food Type - Dog foods come in dry, wet, or raw formulas that each have their benefits and drawbacks. Dog Age - Puppy, adult, and senior dogs all have different nutritional needs that can be addressed by the right kibble. Package Size - Check out the package size in order to compare value across different brands and food types. Dehydrated - Dehydrated dog foods are an offshoot of the raw food craze, offering good value and easy dry storage. Main Protein - From chicken to venison to fish, dog foods have a ton of different proteins to entice and excite your dog. Made In - Choosing a dog food made in the USA or Canada helps ensure you’re getting reliable quality every time. Now that you’re prepared for our reviews… let’s go! Find the best dog food for your maltese in a hurry with our top pick and budget pick, or take your time comparing and contrasting by checking out our other reviews, too. Let’s chow down! 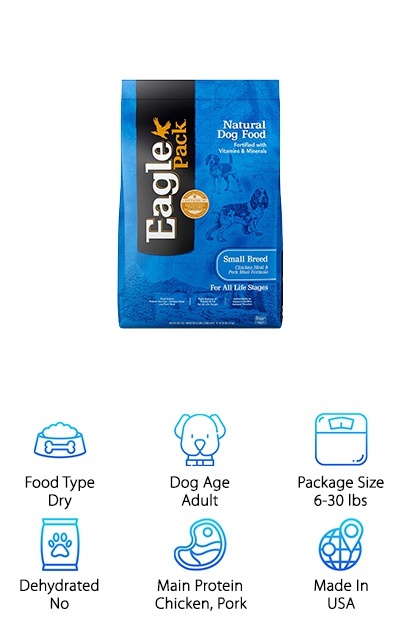 No, it’s not made with real eagle, but Eagle Pack Small Breed Formula is still a great dry dog food for your maltese! This balanced and all-natural kibble starts off strong with chicken meal and pork meal as the main protein sources. With no corn, wheat, or meat by-products, you know your dog is getting a high-quality feast! Wholesome grains, probiotics, and fiber ensure that your dog’s digestive system is running the way it should, while antioxidants help keep their immune system working well. A full range of vitamins and minerals address the skin, coat, bones, teeth, and everything in between! This all-natural small breed dog food also offers a great value despite its amazing ingredients with bags up to 30 pounds available. If you want to pamper your maltese with a dog food with plenty of protein and tasty natural ingredients, Eagle Pack might be the new favorite kibble in your house! Do you need a kibble designed for the needs of your mature or senior maltese? 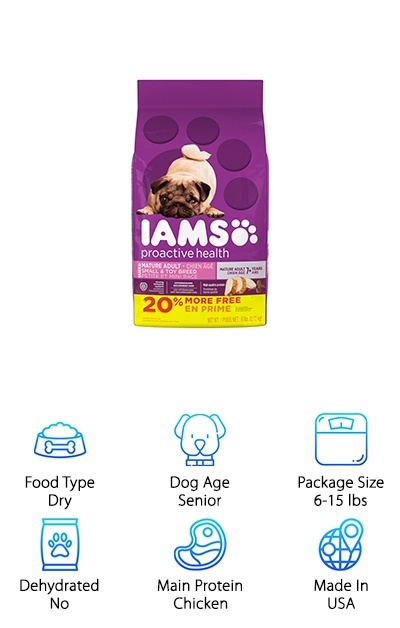 The best food for maltese dogs ages six and up is, in our opinion, this choice from Iams. Although Iams also makes other dog foods for small breeds of different ages, we wanted to put the spotlight on this Senior and Mature Small Breed recipe. Supplements like beta-carotene and vitamin E provide immune system support for older dogs, while glucosamine and chondroitin help to support healthy joints and maintain mobility. Dried beet pulp and FOS are sources of dietary fiber for smooth and easy digestion. Your older maltese will have all of the vitamins and minerals they need to stay healthy and active with Iams Senior & Mature Small Breed dry dog food! The small kibble pieces also encourage your dog to chew instead of swallow whole, which can improve overall digestion and help reduce tartar buildup. Is your maltese a picky eater? 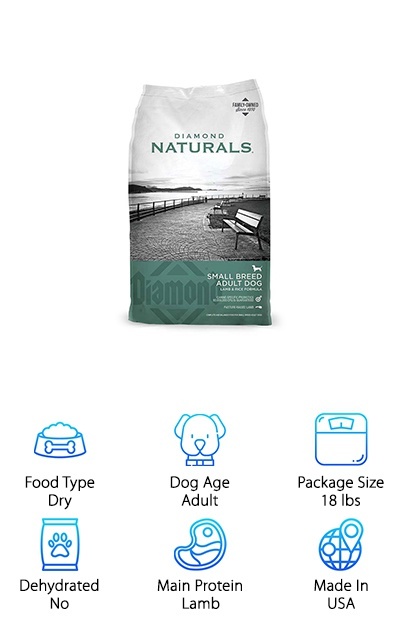 Diamond Naturals Lamb & Rice Small Breed formula might be the perfect recipe! Lamb is easy to digest, and it’s the first ingredient in this dog food. This recipe uses rice and barley instead of corn, soy, or wheat products, which some dog owners prefer (and some dogs are allergic to!). The small kibble pieces encourage chewing for more thorough digestion and good dental health. Beet pulp and chicory root provide natural fiber sources for a smooth digestive process. A complete combination of vitamin and mineral supplements ensures your dog has all of the nutrients they need! Antioxidants support the immune system, while fatty acids help to keep their coat soft and shiny. Small dogs seem to be more prone to fussy eating and sensitive stomachs, so a dog food with fiber and easy-to-digest proteins and carbohydrates can be a big help in maintaining a regular feeding schedule. Some dogs benefit from cutting out grains and chicken products from their diet. 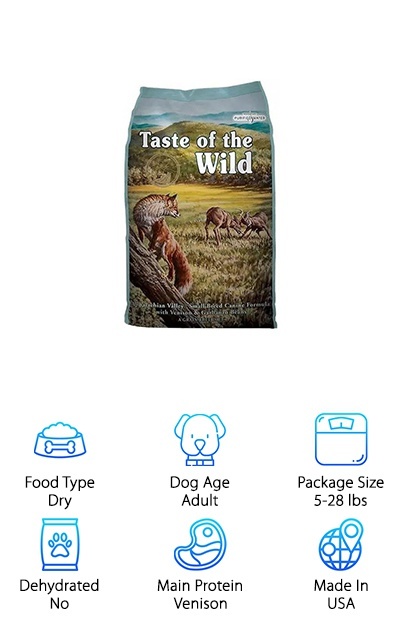 Taste of the Wild offers of a small breed recipe that can be perfect for dogs with sensitive stomachs and allergies to common dog food ingredients. Protein is sourced from venison and lamb meal, which are easy to digest, while legumes provide fiber and complex carbohydrates. Probiotics and fiber are also included in this recipe to help your dog’s digestive system do its best work and improve eliminations. Even the fussiest of eaters can be tempted with Taste of the Wild! This small breed formula provides complete nutrition in a small and nutrient-dense kibble. Some dogs also have improved tear stains when switching away from common dog food options. Looking for a maltese dog food that will indulge your dog’s inner wolf? Your maltese might howl for joy when they’re introduced to Taste of the Wild! The Hill’s Science Diet brand clinically tests their formulas to find the best choices for dogs of every breed and stage of life. Their Small & Toy Breed formula is no different! 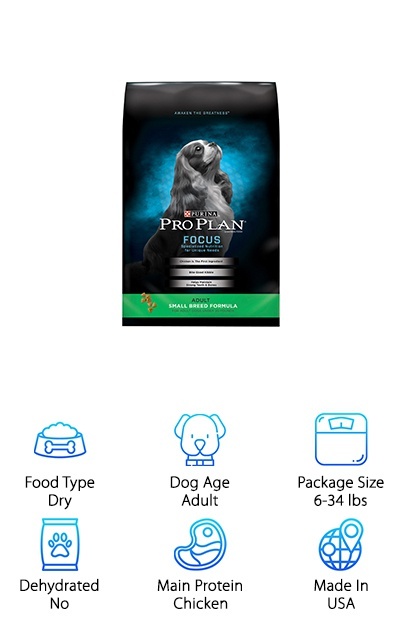 Their Small & Toy Breed line features dog foods for puppies, adults, and seniors under 25 pounds with flavors like Chicken Meal & Barley, Chicken Meal & Rice, and Lamb Meal & Rice. Real vegetables combined with supplements ensure your dog gets all of the vitamins and other nutrients they need. Omega-6 fatty acids and vitamin E promote a shiny, soft coat and healthy skin. Hill’s dog food also avoids using chicken by-product meal, artificial colors, or artificial flavors. This line is made to be easy to digest and easy to chew while providing complete nutrition for small breeds like the maltese. It’s made in the USA, and even veterinarians seem to like it! Choosing a natural dog food made in the USA is one way to show your dog you care. Sometimes dogs can develop allergies to common dog food ingredients like corn and wheat--and even chicken! If you want to cut chicken or other ingredients out of your maltese dog’s diet, Wellness Complete Small Breed has a few great recipes for you! The Whitefish recipe is one example of a poultry-free dog food for small breeds. Other recipes include Turkey & Oatmeal, as well as formulas for puppies, seniors, and weight loss. These recipes have no wheat, corn, soy, or meat by-products, so you can rest assured that your pup is getting a high-quality meal every day! The prebiotics, probiotics, and fiber sources help keep their digestive system functioning well, and other essential vitamins and minerals support their health from nose to tail! Wellness Complete Small Breed recipes are a truly amazing dog food option! Purina is known for their high-value dog food, and their Focus line offers a tasty recipe just for adult small breed dogs. This kibble starts off right with chicken as the main protein source. Each kibble bit is designed for your maltese’s small jaws and teeth. Glucosamine sourced from chicken by-product meal provides support for healthy joints, while calcium, phosphorus, and vitamin D3 keep bones and teeth strong. For the skin and coat, supplements of vitamin A and omega-6 fatty acid helps their coat stay silky soft. This high-protein formula with 29% protein is ideal for active small dogs like the maltese. Plus, prebiotic fiber from wheat bran helps them digest their food thoroughly and consistently. If you need a high-protein dog food that can keep up with your energetic little dog, the Purina Focus Small Breed formula is a great choice with a price that’s easy on the wallet! Do you want to start your puppy’s life right with the best food for maltese puppies? 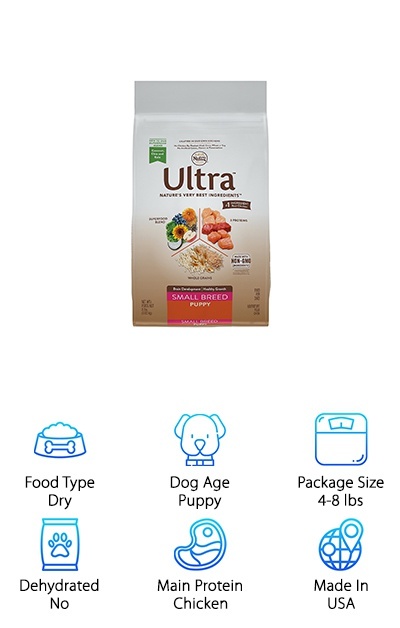 Nutro Ultra might have the dog food for you! Nutro Ultra Small Breed Puppy Food is a grain-free natural dog food with a blend of superfoods like coconut, chia, kale, and flaxseed. Protein is provided by chicken, chicken meal, lamb meal, and salmon meal. These nutrient-rich protein sources are also incredibly flavorful, keeping your pup interested in their food! This puppy kibble is made with no chicken by-product meal, corn, wheat, or soy, and no artificial colors, flavors, or preservatives, either. Natural fiber from beet pulp promotes healthy digestion, and a range of vitamins and minerals are also mixed into this recipe to help support your dog’s overall health. It’s easy to spoil your dog right from the start with this delicious grain-free dog food for small breed puppies! 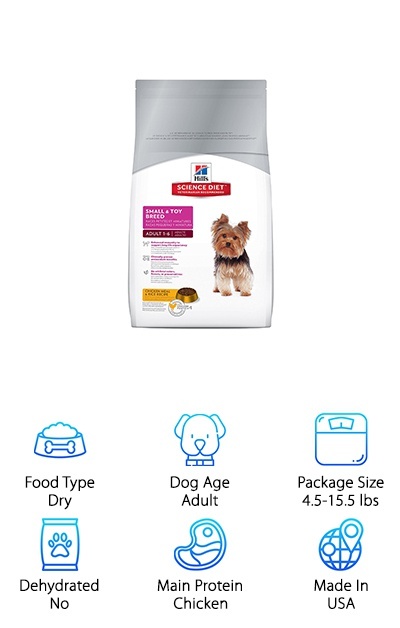 Some people find that the best dog food for maltese tear stains is a holistic, grain-free option like the small breed recipe from Holistic Select. Featuring anchovies, sardines, and chicken meal, this recipe comes in a small kibble size and a ton of flavor. With no corn, soy, or wheat products, this dry dog food starts things off right with rice and oatmeal as carbohydrate sources. Anchovy and sardine meal form the main source of protein, followed by chicken meal and pork meal. Flaxseed provides omega fatty acids for maintaining skin and coat health, and a blend of prebiotics and probiotics with fiber ensure your dog has a healthy digestive system, too! You won’t find any animal by-products or artificial colors, preservatives, and flavors in this kibble, either. 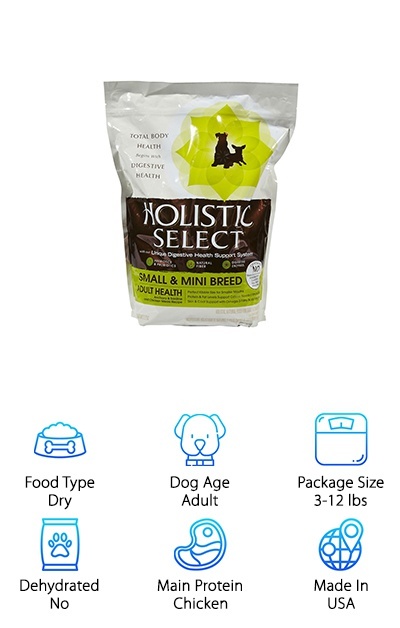 If you want to give your maltese the royal treatment, Holistic Select is a great option! 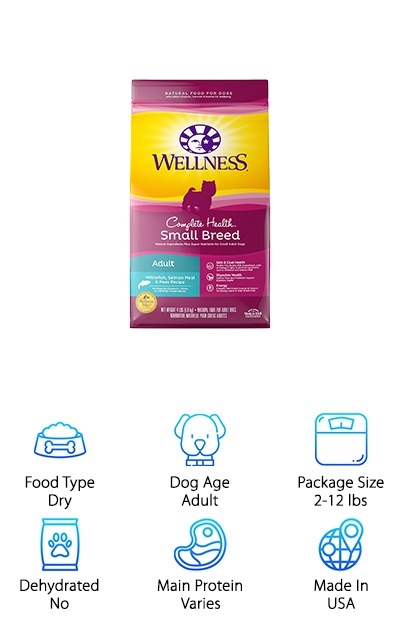 The Hill’s Ideal Balance Small Breed line is made with the small mouths and fast metabolisms of small breeds like the maltese. Rather than corn, wheat, or soy, this dry dog food uses rice, barley, and oats as sources of complex carbohydrates for energy. Protein from fresh chicken is high-quality and helps build and maintain muscle and a healthy weight. Fiber from brown rice and beet pulp help keep digestion running smoothly, while omega-3 and omega-6 fatty acids from flaxseed and other sources help to maintain the skin and coat. Other vitamin and mineral supplements help keep your dog in tip-top shape, too! And it’s all made without artificial colors, flavors, or preservatives. Some maltese show reduced tear stain issues when certain ingredients are cut out of their diet. 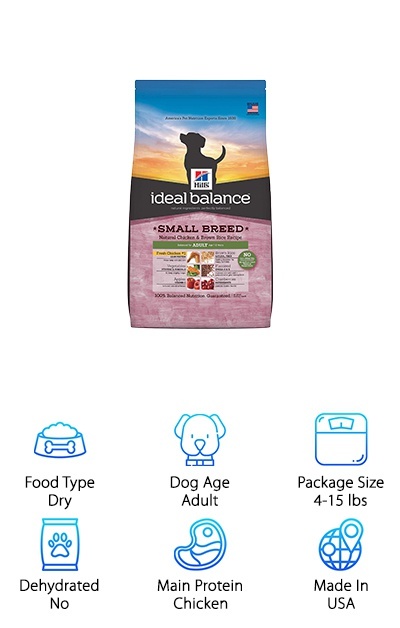 If you’re looking for a balanced, natural dog food free from corn and other common dog food ingredients, Hill’s Ideal Balance might be… ideal!